French Revolutionary War print. Recruitment in Paris 1792. Antique lithograph. 112 years old print. 11'7 x 8'2 inches. 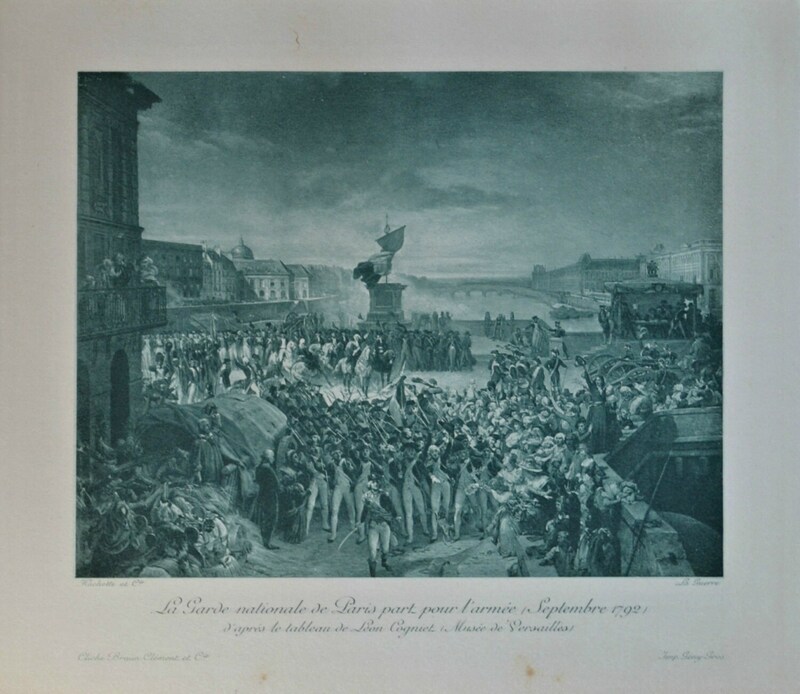 Beautiful engraving representing the painting "La Garde nationale de Paris part pour l’armée, Septembre 1792" (The Paris National Guard on its way to the Army, September 1792) of León Cogniet, painted in 1836 and exposed at Chateau de Versailles. Scene of the soldiers recruitment in Paris, to fight in the French Revolutionary War. Lithograph printed by Wittmann in 1903, published by Hachette & Cie, Paris. 112 years old print. Book plate print. Good condition, sligth damp patches, visibles on pictures. Dimensions 11'7 x 8'2 inches or 30 x 21 cm. Shipment by Certified Mail with tracking number. Cardboard tube. 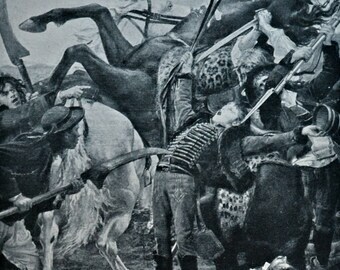 Battle of Fère-Champenoise . Antique lithograph. 111 years old print. 11'7 x 8'2 inches. The War in the Vendée . Antique lithograph. 111 years old print. 11'7 x 8'2 inches. Bonaparte. Antique lithograph. 112 years old print. 11'7 x 8'2 inches. Victorious of Salamine. Antique lithograph. 111 years old print. 11'7 x 8'2 inches. Saint-Quentin pris d'assaut. Antique lithograph. 111 years old print. 11'7 x 8'2 inches. 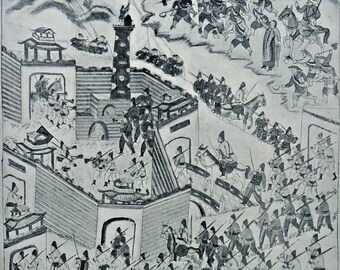 Antique lithograph. "Marche en avant", Roll. 111 years old print. 11'7 x 8'2 inches. La Mort de Bara (1883) by Jean-Joseph Weerts. Antique lithograph. 113 years old print. 11'7 x 8'2 inches. Algeria campaign . Combat Oued el Alleg. Raffet. 1903 lithograph. 111 years old print. 11'7 x 8'2 inches. Conquest of Tunis by Charles V. Antique lithograph. 113 years old print. 11'7 x 8'2 inches. Tourney scene at 14th century. Antique lithograph. 111 years old print. 11'7 x 8'2 inches. Entry of the Crusaders in Constantinople. Antique lithograph. 111 years old print. 11'7 x 8'2 inches. Reception of Le Grand Conde at Versailles. Antique lithograph. 115 years old print. 11'7 x 8'2 inches. Hong-Hoa capture by France. Antique lithograph. 114 years old print. 11'7 x 8'2 inches. Chief funeral in the iron age. Antique lithograph. 111 years old print. 11'7 x 8'2 inches. The Battle of Champigny, de Neuville. Military print. Antique lithograph. 112 years old print. 11'7 x 8'2 inches.